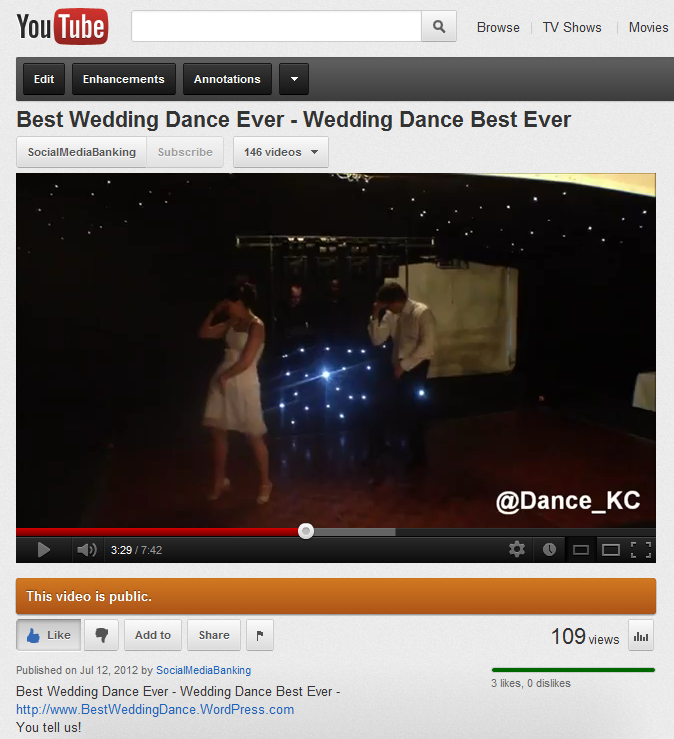 A few days after being uploaded on to YouTube, our ‘Best Wedding Dance Ever‘ video has already been watched 100 times. And this is just the beginning. Since coming back home the day after our wedding day, I have been busy sharing and giving visibility to our wedding dance routing we love so much. I am glad to announce that we reached the 100 views mark! Of course, this number is dwarfed by the most watched wedding dance videos on youtube and their dozens of millions of views. But it is just the beginning, and now I will start promoting it on social media channels such as twitter or facebook. Stay tuned! Have you watched it yet? If yes, please like it directly on youtube and connect with us on twitter. If not, we invite you to watch it now on this site. Thank you all for helping us sharing those fantastic memories with the whole world, and connect with couples out there willing to do something special on their wedding day, and newlyweds who delivered an original first dance to the delight of their guests. This entry was posted in Funny Wedding Dance and tagged Best Wedding Dance Ever, Milestones, Videos, YouTube. Bookmark the permalink.